There are few experiences more thrilling than seeing the world's largest animals swimming freely in the wild - though one of the most fascinating aspects of whale-watching may be the fact that humans aren't the only ones who seem eager for a peek. On Monday, tourists on a Whale Watching Sydney vessel were treated to an unforgettable site as a humpback whale approached and repeatedly surfaced from the water as if to get a better look at the people on board. While the surfacing behavior, called "spyhopping", indicates a remarkable sense of inquisitiveness, the scene below the surface is no less impressive. 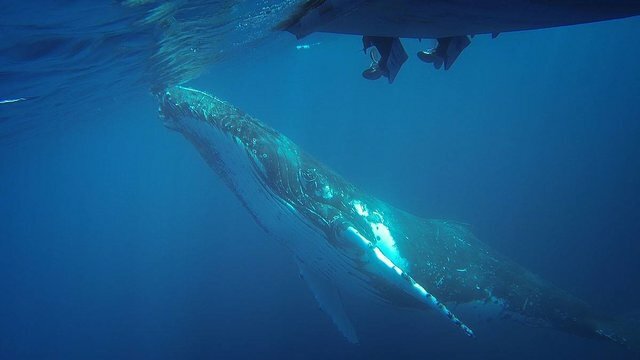 Geoffrey Ross, of New South Wales Parks and Wildlife, tells Australia's 7 News that whales are naturally curious animals, so it's no surprise that the humpback dropped by to see who might be aboard. "They really like to come up and have a bit of a look around in their environment," says Ross. "Looking at a vessel that's nine or ten kilometers offshore is very interesting to passing whales."